Thank you for visiting. Please note our location has changed. We are now serving the Sacramento area. Where flavor and style are one in the same. Order a cake from Sweet Kisses and you will not be disappointed. From Chocolate Lovers Chocolate to Mandarin Orange, our flavors will tantalize anyone’s pallet, and your cake will look just as stunning. 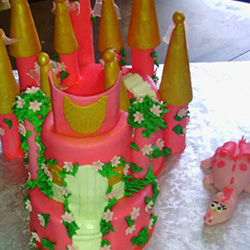 We specialize in American Buttercream, Homemade Fondant, and scrumptious array of fillings. View our galleries for ideas to complete your next celebration. We endeavor to create the perfect wedding cake that captures each couples personality. 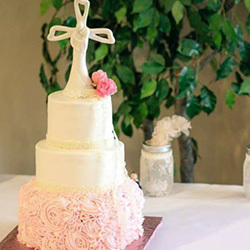 From whimsical to simple and elegant, each cake tells a couples story. Click Here to schedule a tasting. Make your baby shower extra special with an amazing cake from Sweet Kisses. 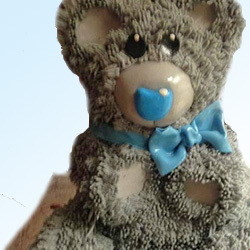 Whether its a life-like teddy bear, or traditional tiered cake, we can make it happen! Celebrate any special occasion in the most memorable way with a creative cake by Sweet Kisses Cake Company. Surprise your loved one with an extra special cake!